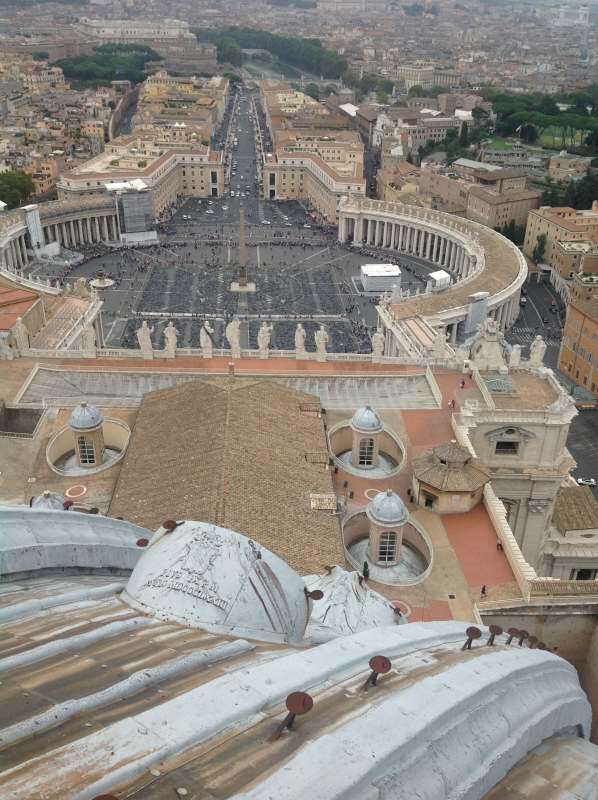 Climbing to the top of St Peter’s dome is one of the highlights of a trip to Rome. Here is how to climb the dome and how to skip the queue. 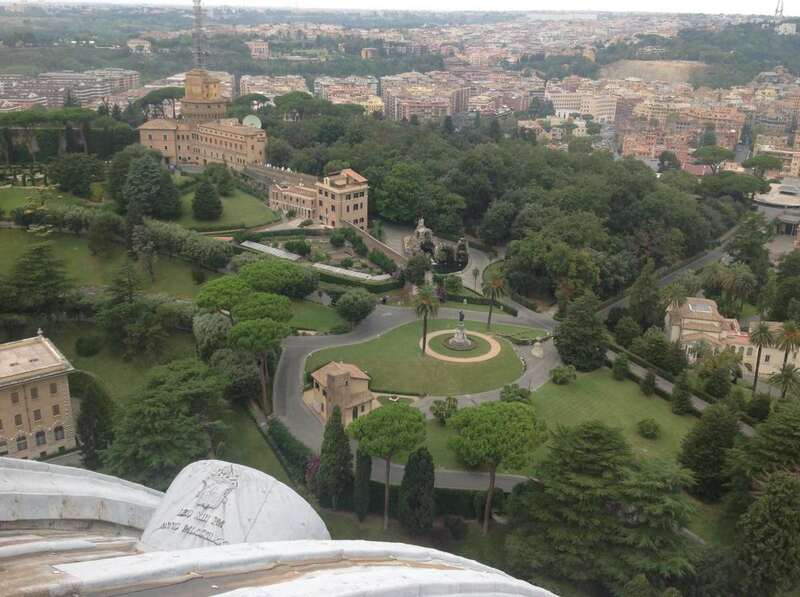 Not that many visitors know that it is possible to climb up to the top of St Peter’s dome (the “cupola”). 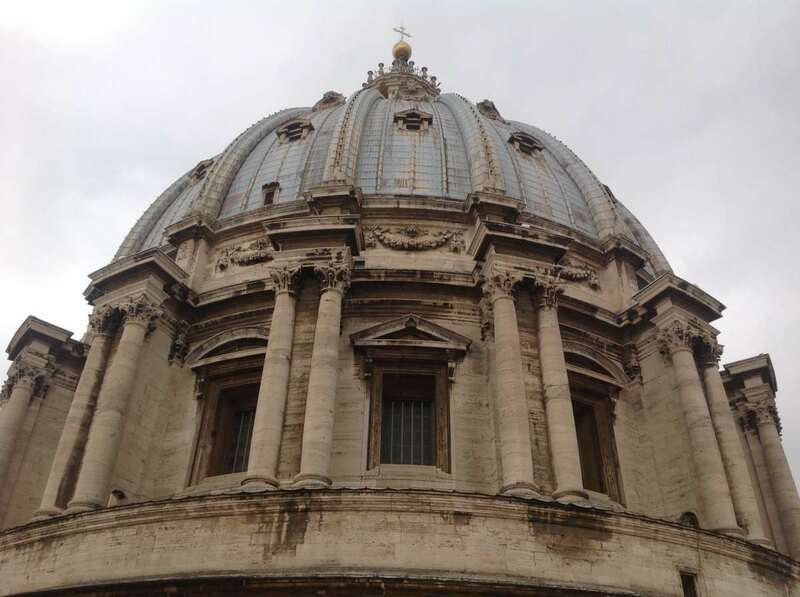 Actually getting on top of St Peter’s dome is one of Rome must do, and a great opportunity to enjoy a fantastic and dizzying city panorama all around Rome and to admire a top down view of St Peter’s basilica nave. Best thing for you would be to visit the dome first thing in the morning, when it opens, at 8:00 AM. Not much queue at that time, you may have the dome almost for yourself. 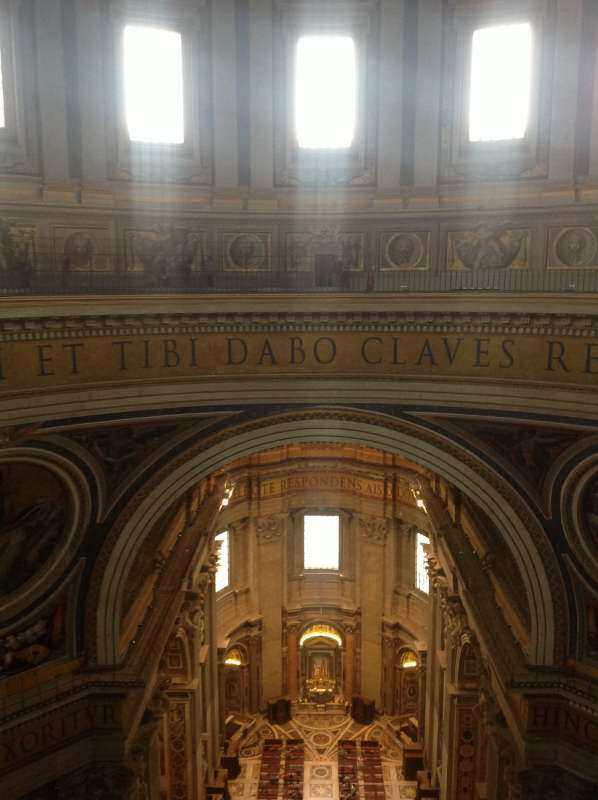 In that case, you may first climb up the dome and then visit St Peter’s basilica (when you get down from the dome you will end up in the nave). A good alternative is to climb on top of St Peter’s dome before it closes: you will then admire Rome in its unique sunset golden light. In Wintertime, you will see Rome’s lights and, at Christmas, the huge Christmas tree in St Peter’s square. Similarly, first go up to the dome, then visit the Basilica, which closes later than the dome. In summertime, better to avoid climbing on top of St Peters dome in the hottest hours of the day: the stairs and the viewpoint can get very hot and uncomfortable at that time. 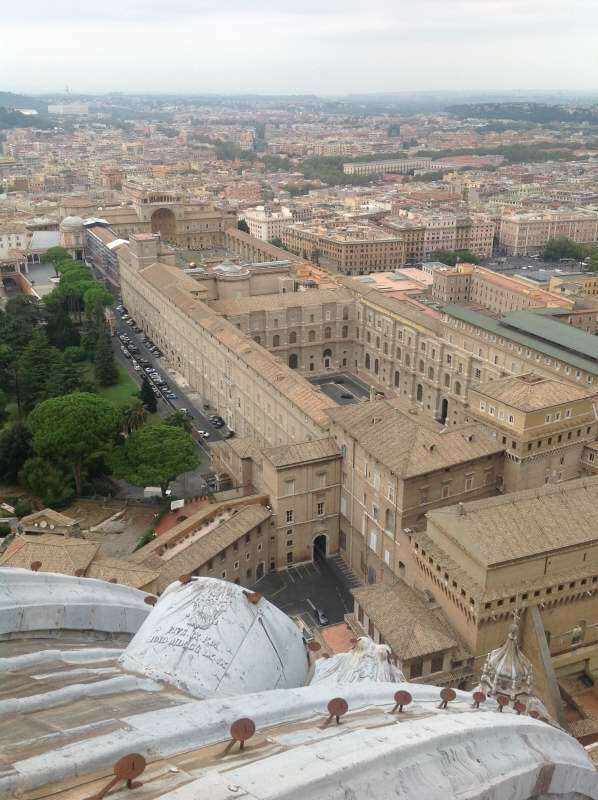 In order to climb up St Peter’s dome, you need to go throw St Peter cathedral security check. At the entrance to the basilica, after the security check, look right. There is a sign that directs you to the far right of the portico (past the Holy Door) and to the kiosk for the elevator. This is where you purchase the tickets to St Peter’s dome. Note that the Basilica entrance is on the right side of the colonnade. In high season, queues could be very long and spoil part of your day. 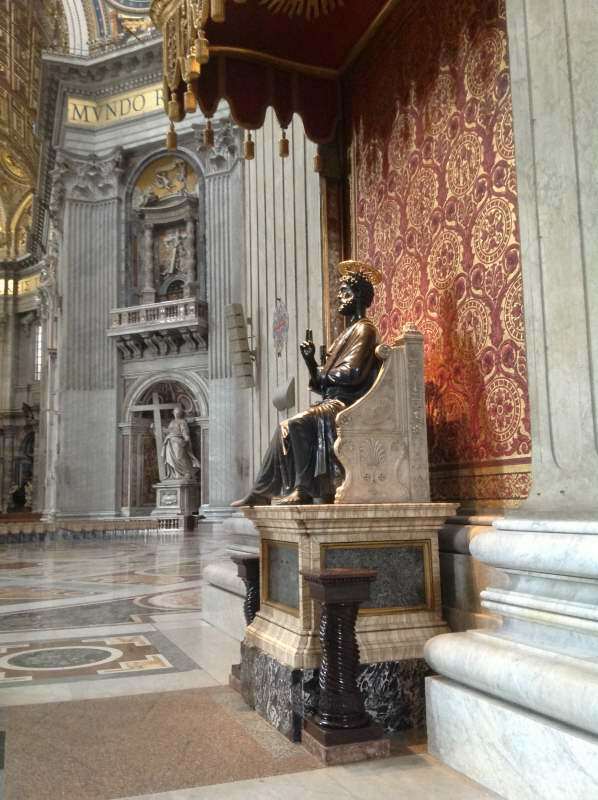 I would recommend to purchase a St Peter Basilica skip the line ticket and save your valuable time (follow this link to check availabilty and prices). You can take the elevator to the roof level (saving 320 steps). However, if you want to get to the top of the dome you must take the stairs for the last portion. This makes 551 steps in total. The entrance cost is Cost 10 Euros for elevator, 8 Euros for stairs. After the brief elevator ride (or the first 320 steps) stop before your climb to the dome. 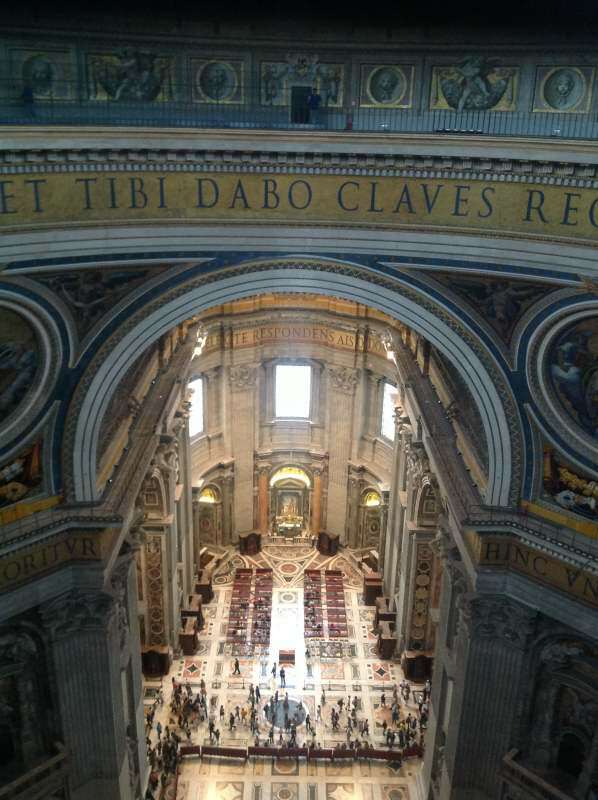 Here you can enjoy a great view from the gallery inside the dome looking down into the basilica . Take a few moments to absorb the astonishing beauty of the cupola from within – and looking down – the main altar. Michelangelo himself designed this dome, which measurs 135m (450 ft.) above the ground at its top and stretches 42m (139 ft.) in diameter. Legend has it that in deference to the Pantheon, Michelangelo made his dome 1.5m (5 ft.) shorter across. He then said: “I could build one bigger, but not more beautiful, than that of the Pantheon.” Carlo Maderno later added the dome-top lantern. The climb to the top of the dome proceeds through progressively narrower and sloping stairs. 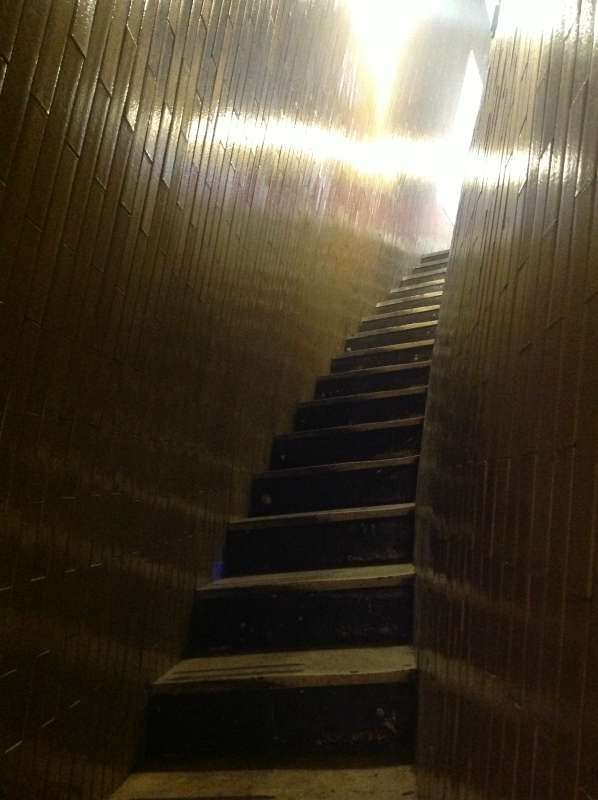 The narrow passageway can be uncomfortable if you are claustrophobic. Note that it could also get crowded and hot in summertime. Luckily, there are “slits” here and there to let fresh air in. Since you’re going up during the daylight hours you’ll have the interior lights plus sunlight now and then. Back on the roof, you have access to restrooms, water fountains, a gift shop and a new coffee bar. Take a walk to the front of the basilica to look into the Square. Observe the huge statues on the facade and the imposing Cupola just above you. When you’re ready to leave, there is again the option of elevator or stairs. Consider taking the stairs down, as this area contains marble plaques of all the famous who have visited the dome over the years. Going down takes much less time than going up! Astonishingly, the exit is directly in St Peter’s nave, that you can now visit. Dress code: St. Peter’s has a strict dress code: no shorts, no skirts above the knee, and no bare shoulders. I am not kidding. They will not let you in if you do not come dressed appropriately. However, guys and gals alike can buy a big, cheap scarf from a nearby souvenir stand. Wrap it around legs as a long skirt or throw over shoulders as a shawl and they will let you in. Drop your bags: they no longer allow you to take large bags or purses into the basilica. Luckily, there is a drop-off point for all bags in a room to the right of the steps leading into the church. This service is free. Free Tours: There are free guided visits to St. Peter’s run by volunteer professors and scholars from North American College in Rome. They’re offered Mon–Fri at 2:15pm and 3pm, Sat at 10:15am and 2:15pm, and Sun at 2:30pm. They meet in front of the Vatican tourist info office, which is to the building along Piazza S. Pietro just left (south) of the main steps into the basilica. 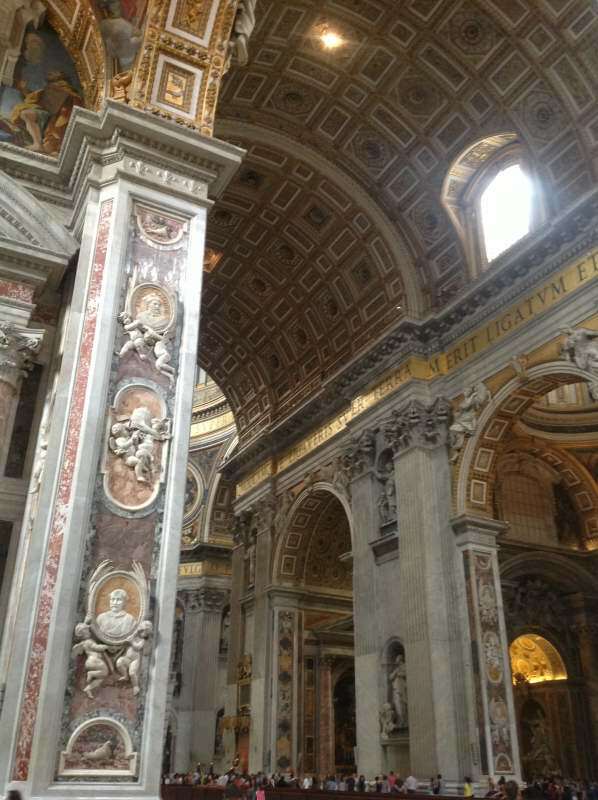 Otherwise, follow this link to skip the queues and get a complete St Peter’s basilica tour. 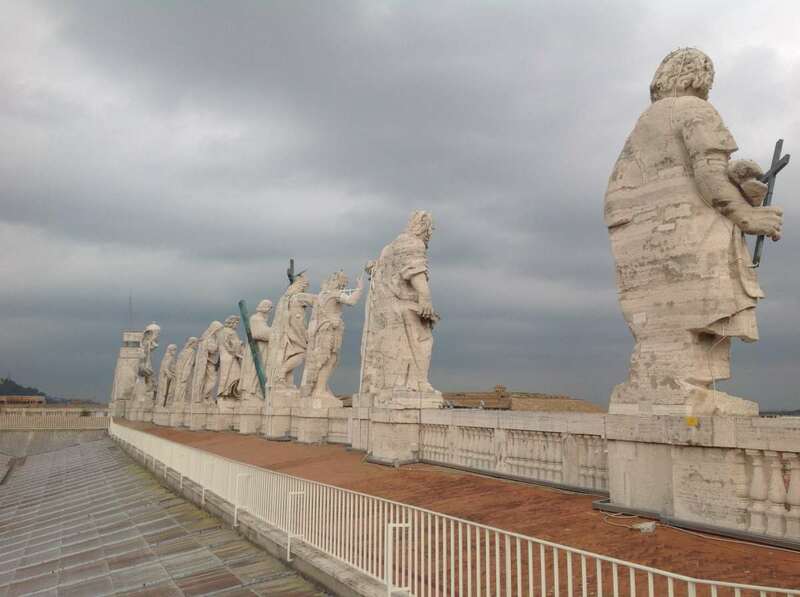 Enjoy your ascent to St Peter’s dome! 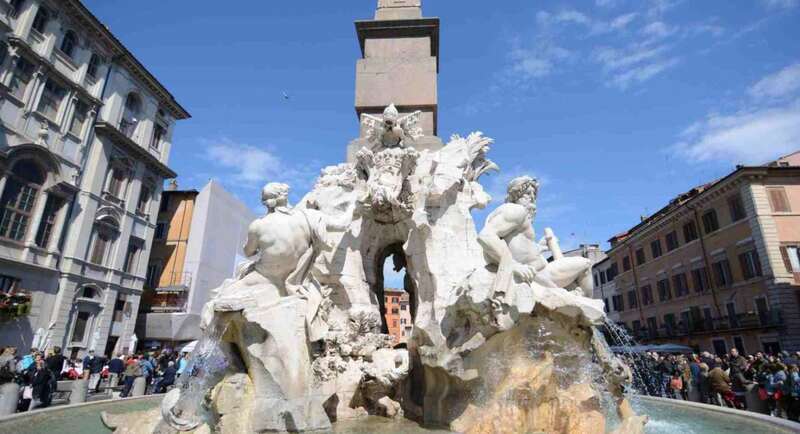 You can live unforgettable experiences in Rome! Click here to check your many options, from guided tours to shopping, food experiences and more! This is a perfect description on what I wanted. Thank You !! I’m happy you liked it. Have a nice climb! Thanks for this description! The kids will be really impressed with me now that I know all this 🙂 Is it possible to book the dome tickets online beforehand? Thanks for your appreciation! Your kids will love the climb (as did my son!) 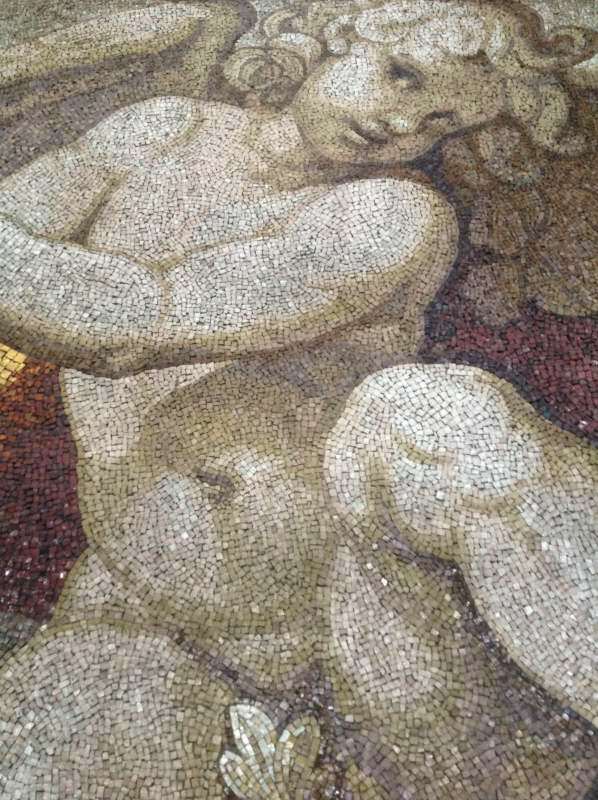 As far as I know, you can’t reserve your visit with the Vatican (http://www.vatican.va/various/basiliche/san_pietro/it/cupola/orari.htm). I think taht some tour operators have tours including the dome, wth the “skip the line” option, but of course it’s going to cost more. Try to get there very early in the morning or at lunch time, you shouldn’t wait too much. Enjoy your climb! I just got back from Rome and climbed all the steps. I have not found any accurate descriptions of what you are actually climbing. There are not 320 steps to the roof level. There are actually less than 200. After the roof level, the real climb starts and it is definitely over 320 steps. I counted them and everybody has to climb them as there are no elevators past this point. This is a formidable climb. There are a LOT of steps. It is very steep and extremely narrow much of the way. I believe I counted close to 340 from the very top down to the roof level but I am not 100% sure as it was hard to concentrate. I’m glad I did it but I’m very surprised they don’t tell you this when you get there. The 7 euro you pay for the elevator implies you are skipping the steps but if you want to go to the very top, you are definitely going to have to climb well over 300 steps. Hi Andy, thank you for your useful note. You are right, there is no signage to tell visitor what they should expect when climbing the dome. It says “551 steps” after the elevator. It seemed like more! I did it two years ago at the age of 79. It was early in the morning so it wasn’t as hot as it might have been, and it wasn’t crowded. Are there places to sit and pause on your way up or do you have to keep going ? Did this climb today…it was worth every step! where can we buy ticket to climb the Dome? and what is the best time to climb the Dome? The entrance to the Dome stairs and lift is on the riht side of the basilica, after the security check. There you will find the ticket office. Last time I went, it was Sunday, lunch time, and the queue was not longer than 10′. As usual, the sooner, the better(the dome opens at 8:00). 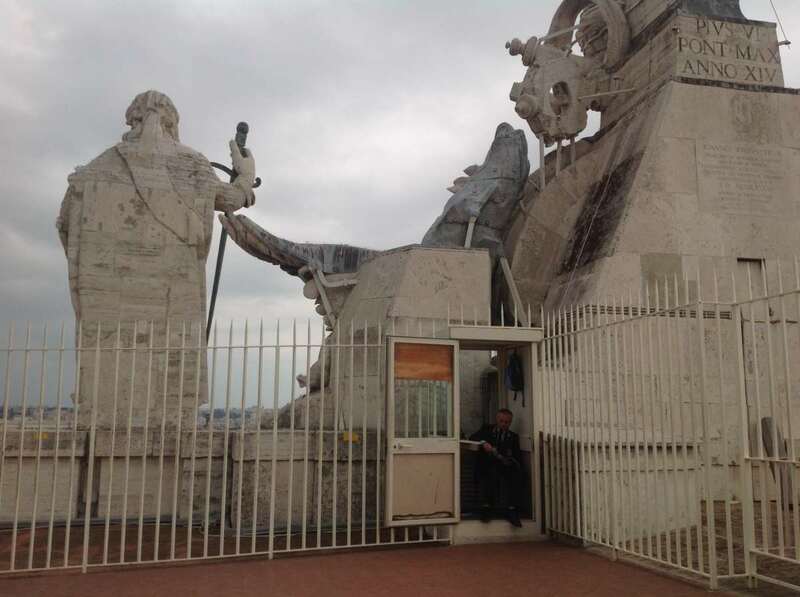 Consider that on the way down you can access directly St Peter basilica, so you won’t need to go over the queue again. Hi! How long is the free tour? I plan on booking a 3pm ticket into the Vatican Museum, but still want to catch part of the 2:15pm tour. Thank you!! Hi Elizabeth, the free guided tour (in English) are conducted by seminarians from the Pontifical North American Collegeand last approximately two hours. Hello, How long does it takes to climb the dome? Up and Down! From the moment you get to the stairs, one hour is more than enough. However, you will probably want to indulge on the dome and on st peter’s terrace, so schedule your day accordingly. Have a nice climb! We went on the first trip up and it was incredibly gorgeous! Hi, what a nice and helpful info! For the free tour guided by scholars from North American College, what language do they use? Thanks in advance. This is a wonderful description. However this tour is not to be taken lightly by couch potatoes or those who rarely do any stair climbing. I nearly passed out! If we don’t want to go into the basilica just the cupola is this possible? Do we still need to get in the queue for the basilica or is there a separate queue/entrance? Thanks Jenny, you made my day! What an interesting and descriptive article. I’m having a cruise holiday in October and have just 1 day in Rome so am trying to make a plan in advance so that I see as much as possible. I was planning to start my day at St Peter’s but now am torn between beating the queue to the roof and the free afternoon tours. Do you know if there any sort of audio tour available? Thanks for the tip Jean-Pierre, this is just what I was looking for. are me allowed to wear shorts? are men allowed to wear shorts? Hi Ron, the rules are that men and women must have knees and shoulders covered. I went today and the prices were 6 for the stairs and 8 for the elevator. I was under the impression that you could take the elevator to the roof level only of St. Peter’s, if you so choose, than return by elevator without having to climb to the top. Is that correct or are you committed to climb the remaining stairs once you are at roof level? I have a partner with an ankle injury who would like to have this view of the church but cannot climb at this point. Thank you for generously sharing your infomation. 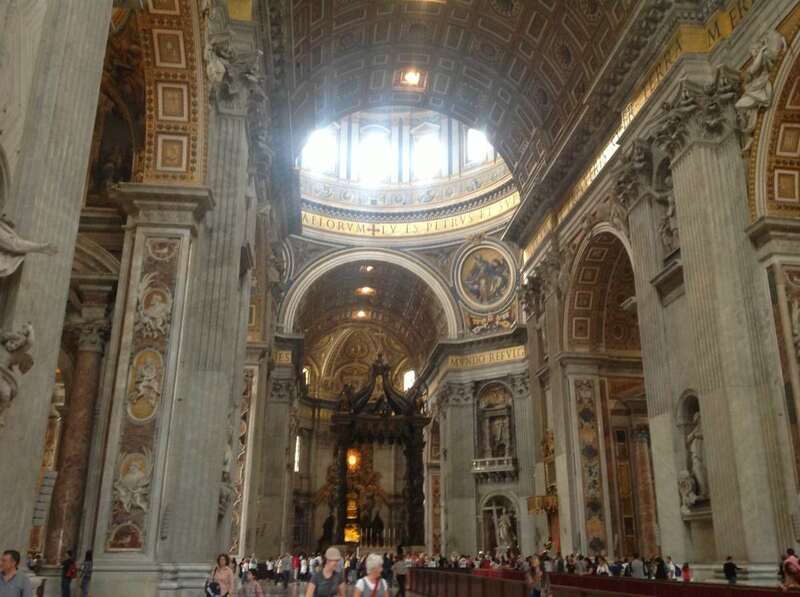 Is the entrance in the St. Peter’s Basilica free of charge if you do not need audio guide tour?? Is it possible to buy tickets JUST to climb the Dome online, so we can skip the line?? Thank you so much for the tip! We are scheduled for the Scavi tour at 3:30p… what time do you suggest we visit the top of the dome? One question. Does the $15 include the skip-the-line entrance PLUS the trip to the top? Or do we have to pay an additional $8 to go up the dome too? No, the climbing to the top is not included, you will need to purchase a separate ticcket. However, you won’t need to queue again for the security checks. Thank you so much Jean-Pierre! Thank You so much for sharing your experience to us. I’m going to visit Rome for the very first time this week. Pingback: See inside the Vatican — home to the world's most powerful religious leader, where 9 miles of museums house some of the most stunning works of art - . Wonderful ! Very interesting !